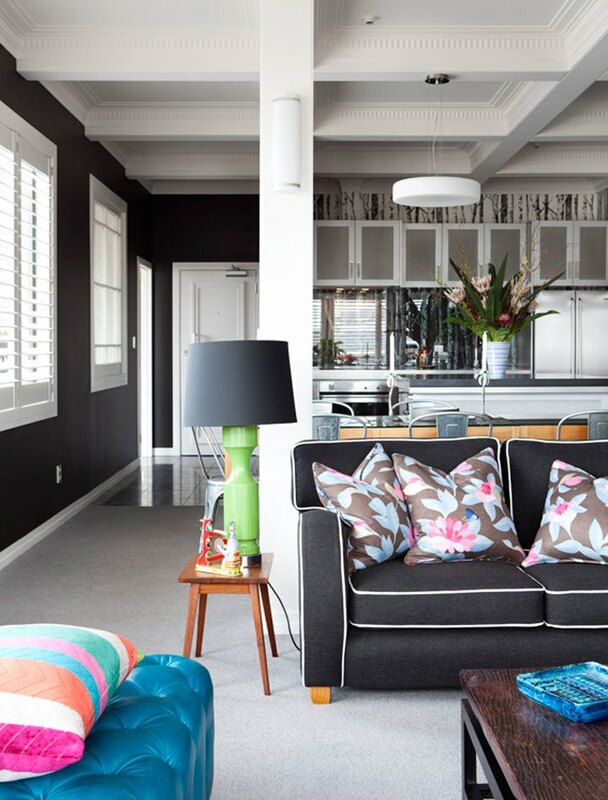 The term “apartment living” does interior designer Neil McLachlan’s CBD penthouse a disservice. This sophisticated urban oasis offers the chance to experience the intimacy of big-city lights after dark while sheltering from the high-rise breeze in front of an outdoor gas fire’s radiant warmth. It wasn’t always this way. When Neil purchased the property, it was so tired and dated that he was forced to strip it back to its concrete foundations and begin again. The results are clearly worth the time and effort. It is harder to achieve a homely, grounded feel in an apartment where there is no surrounding landscape to trade off, but Neil has struck the perfect balance between urban sophistication and comfort. Stainless-steel benches and dark-toned walls reflect the urban setting, while vintage pieces soften and complement the modern lines. Far from the typical claustrophobic inner-city crash pad, the penthouse boasts an expansive living space with elegantly high ceilings. Bold yet contained graphic patterns result in a strong, smart, crisp aesthetic, which carries through the double doors to the spacious deck. En route, colonial-style white shutters usher in natural light, which is reflected throughout the room by bevelled mirrors. 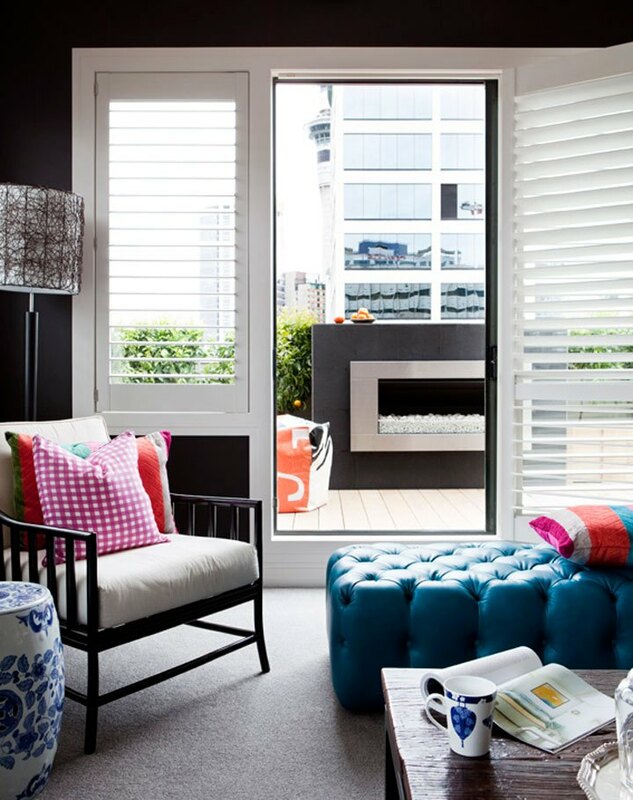 Like the interior, the deck area trades off modern industrialism tempered by quirky pattern and texture – in this case, brightly coloured beanbags made to be sunk into after a long day at work. The centrepiece of the outdoor area is an Escea EF5000 gas fireplace, which makes a glass of wine amidst the twinkling lights of the city an irresistible prospect on even the coldest winter nights. The EF5000 offers radiant heat at the touch of a button, and is compatible with various fascias and fuel beds. Neil chose a white coal fuel bed and a stainless-steel fascia to recall the squared-off feature mirrors of the living room. The EF5000 is rated zero clearance, meaning it can be installed into any space without fire-proofing. 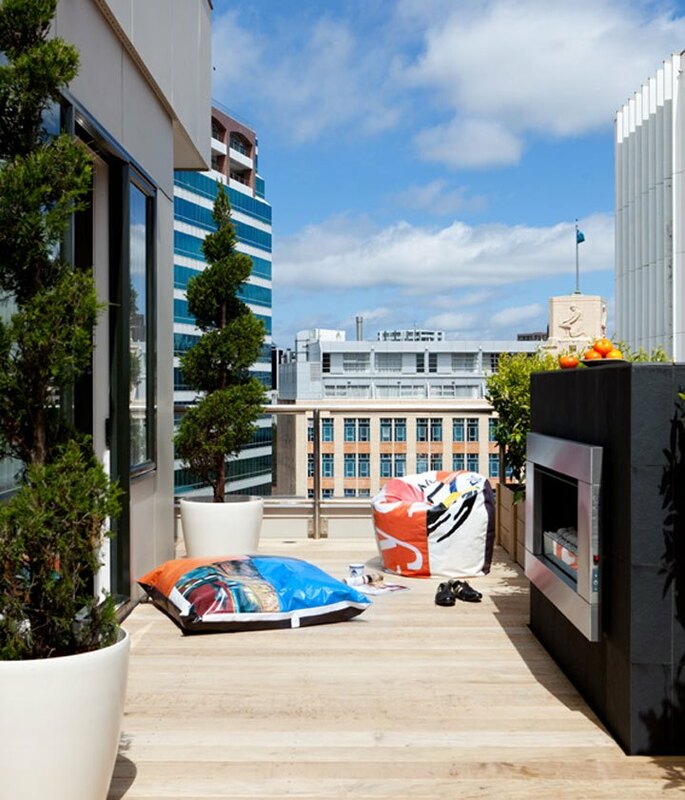 This makes it even easier to create your own cosy outdoor retreat – rooftop or otherwise.